We're only less than one month in to 2013, but I'm officially declaring this year the year of opportunities. Today is Jeff's first day at his new job and it's one we're really excited about. 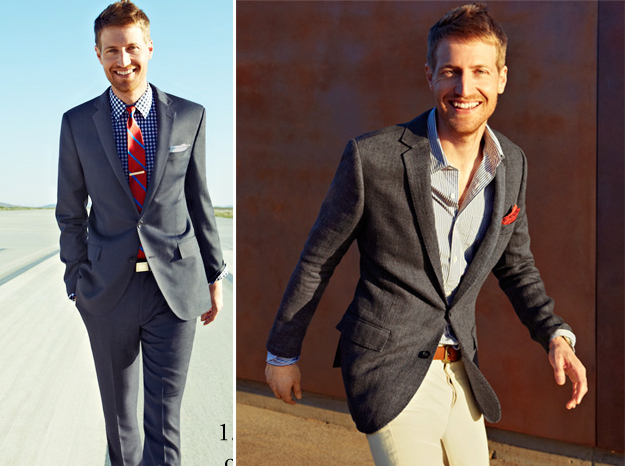 So in honor of the occasion, today's post is our first post about men's style. With his new job in mind, Jeff searched the world wide web for work appropriate clothing that he would be stoked to wear. His top three search terms? 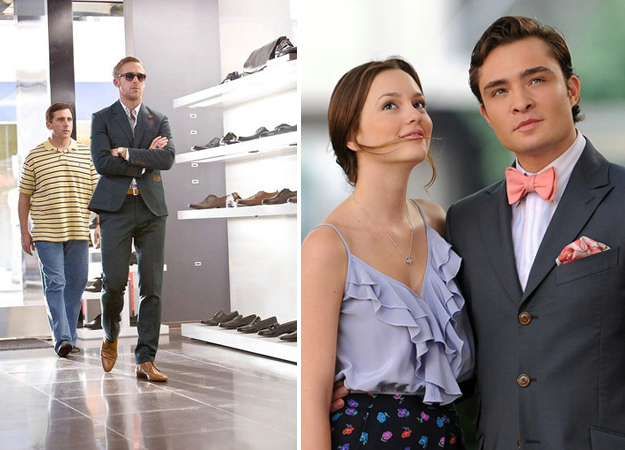 J.Crew, Chuck Bass and Crazy, Stupid, Love outfits. That last one obviously refers to all the amazing clothing that Ryan Gosling wore in the film. And that's definitely something he and I both agree on! Here are a few of Jeff's current favorite ensembles, as described by the man himself. As much as women have a big crush on Ryan Gosling, I have a man crush on his character's wardrobe in the movie Crazy, Stupid, Love. Additionally, I also have a man crush on Chuck Bass' character and his character's clothing as well. Not everything they wear in these roles is something I would wear myself, but for the most part I really liked their style in general. In my opinion, a custom, tailored suit can do wonders for a man's wardrobe. Left: I like the navy blue suit paired with the brown shoes. Right: I like the material of this suit because it's so classic. Left: I like the idea of wearing printed shirts with a suit. 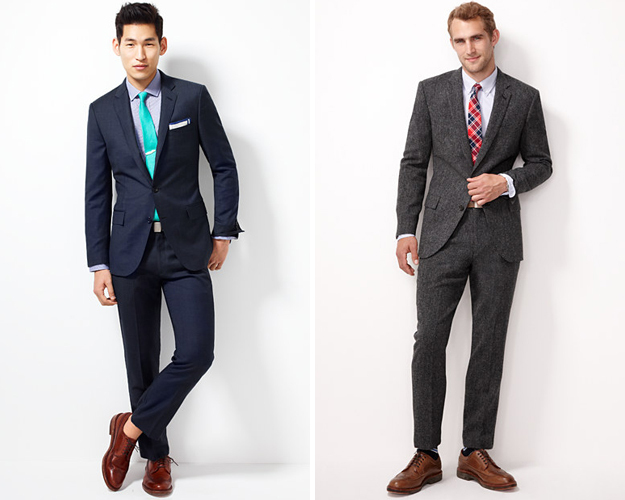 Right: This is more of a business casual look that still looks nice without it being a suit. 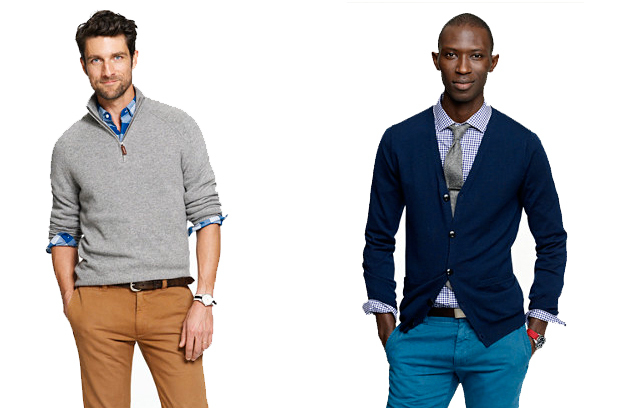 Left & Right: Sweaters add diversity to the business casual look and I like how each one, although both paired with a button down shirt look completely different. I also like the bold color of the pants on the right. All of the clothing featured above (aside from Ryan Gosling and Chuck Bass) is from J.Crew.